Home » Health » What Is Epidural Hematoma? Epidural Hematoma is a condition in which blood enters and accumulates in the space between the skull and the lining that surrounds the brain or called the dura. The entry of blood into the room is caused by a head injury that causes skull fractures, damage or tear of the dura layer, or brain blood vessels. The accumulation of blood in the space between the skull and the dura layer increases pressure on the head and has the potential to suppress the brain. This condition can cause visual impairment, movement, awareness, and speaking ability. 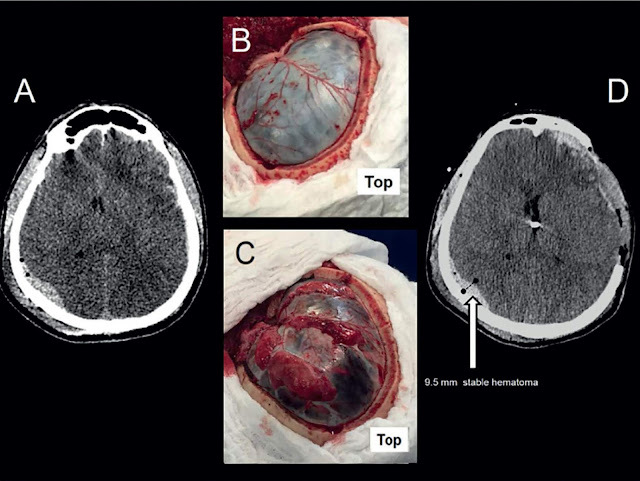 Epidural hematoma must be treated immediately. If not, this condition can cause death. Epidural hematoma is caused by the entry and accumulation of blood in the space between the skull and the layer that covers the brain (dura). Head injuries that cause skull fractures, damage or tear of the dura layer, or blood vessels in the brain, make blood enter the space between the skull bones and the dura. Own head injuries are generally caused by accidents, such as when driving or exercising. The entry and accumulation of blood in the space between the skull and dura also increases the pressure in the head cavity. This can cause damage to the brain and other health problems. Children under 2 years of age have a higher risk of developing epidural hematoma if they experience a collision of the head, because the membrane or lining that surrounds the brain is not fully attached to the skull bone. Middle of taking blood thinners. Do not use personal protective equipment when undergoing high-risk activities, such as driving and exercising. Symptoms of epidural hematoma can be felt a few minutes or even several hours after the accident occurred. Therefore, it would be better if you immediately see a doctor after an accident or impact on the head. Some epidural hematoma sufferers also experience patterned symptoms. The symptom begins with a decrease in consciousness , then realizes, and a few moments later his consciousness disappears. Neurology test. This physical examination is done to check the ability of motion, sensory, balance, to mental patients. The neurology test aims to examine the function of the central nervous system (brain and spinal cord). This test will use simple instruments, such as flashlights and special hammers. CT scan. CT scans are used to observe and see the condition of the skull and brain. Electroencephalography (EEG). This test is used to observe electrical activity in the brain. The doctor will adjust the treatment to the severity of the condition and symptoms that appear. In this case, the patient must also tell the doctor if he has other health problems. Other conditions suffered by patients also determine the method of treatment to be performed. Operation. Surgery is a method of treatment that is performed to overcome epidural hematoma. The surgery aims to drain the pile of blood in the space between the skull and dura bones. This procedure uses anesthesia. Tell your doctor if you have a history of drug allergies . Drug. Doctors can provide mannitol infusion to reduce pressure on the head (intracranial) due to blood buildup. Rehabilitation. The doctor will advise patients to consult a medical rehabilitation doctor and undergo physiotherapy. Physiotherapy aims to train lost limb functions arising from injuries that are experienced, such as difficulty walking, paralysis, numbness, and unable to withstand defecation or bladder. Avoid sports with physical contact. Use personal protective equipment when driving or exercising. Avoid consuming alcohol, especially when going to drive. Take care in your activities, and clean the environment of objects that can make you fall. A person suffering from an epidural hematoma is at risk of experiencing additional symptoms due to brain injury, such as seizures, even though the epidural hematoma itself has been overcome. Usually these additional symptoms appear up to 2 years after the patient has an accident, and in some cases can disappear by itself. Brain herniation. Conditions in which the part of the brain shifts or moves from its original location. Hydrocephalus. Conditions in which there is an increase in cerebrospinal fluid in the brain that interferes with brain function. 0 Response to "What Is Epidural Hematoma? "